The University of Pennsylvania Wharton School full-time MBA program takes place over the course of 20 months, with students having multiple options for the summer between their first and second years: internships, “career treks” in the U.S. or abroad, the Wharton International Volunteer Program, or working with a nonprofit through the Summer Public Interest Fund. In 2012 Wharton introduced a new curriculum to its full-time MBA program with the aim of creating more flexibility over the order in which students complete required courses. Wharton School Full-Time MBA students must take six required core courses in August and the first half of their first year with a cohort of about 70 students and a “learning team” of five or six classmates. Flexible core courses can be delayed until the second year, which gives first year students the opportunity to begin personalizing their course of study by choosing electives early on in their MBA process. Starting when they arrive on campus in August, cohorts will take the following fixed courses: Foundations of Teamwork and Leadership, Marketing Management, Microeconomic Foundations, Advanced Topics in Managerial Economics, Regression Analysis for Managers, and Speaking and Writing. The fixed core courses are worth a total of 9.5 credits. The required core curriculum also includes first-semester courses in speaking and writing. The flexible core portion of required courses allows students to choose from a number of options, including courses focused on Operations, Marketing, Accounting, Corporate Finance, Legal Studies and Business Ethics, Management, and Macroeconomics. Out of these overarching topics, students must choose two options for further study, which are worth an additional 5.5 credits. For example, a student interested in Operations Management could start fulfilling their flexible core by taking one course such as Business Analytics, Information Technology, Innovation, or Operation Strategy. The new structure of this curriculum gives students the chance to begin taking electives in their first year, as long as they complete the core curriculum at some point in their second year. As a result, students can begin pursuing their interests through choosing from Wharton’s over 200 electives. The Wharton Class of 2020 features 43 percent female students, 33 percent international students, and 33 percent students of minority status. On average, enrolled students have around five years of previous professional work experience, an undergraduate GPA of 3.6, and a median GMAT score of 732. The most recently Wharton MBA employment report notes that 98.4 percent of recent MBA graduates earned job offers within three months of graduation, with 94.6 percent accepting those offers. The median salary of those graduates was $135,000, with 74.4 percent earning a signing bonus of around $30,000. 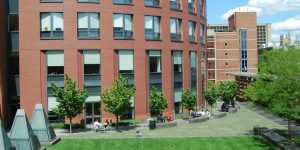 Tuition and fees for the Wharton School full-time MBA, which includes a $2,000 pre-term fee, is $78,948 for 2018-19. This cost increases once room and board, health insurance, books and supplies and ‘miscellaneous’ expenses are factored in. The total cost estimate for one year at Wharton is $111,900. Students in the full-time program are all considered for one of Wharton’s fellowships. These fellowships can contribute to the costs of both years of schooling, though some are only for second years. Federal student loans are available, as are private alternative loans. Wharton offers a number of scholarships for specific populations, as well as the John M. Bendheim Loan Forgiveness Fund for Public Service. Additionally, Wharton participates in the Yellow Ribbon Program for armed forces veterans. In addition to filling out its online application, applicants to the Wharton School full-time MBA program will also be required to submit one mandatory and one optional essay, any undergraduate or graduate school transcripts, two letters of recommendation, GMAT or GRE scores, and a resume. International students may have to provide their TOEFL scores while those pursuing dual degrees may need to provide supplemental information to one or both programs. Those targeting the Lauder MBA/MA program will be required to submit to a telephone interview to demonstrate their language skills through a twenty minute “Oral Proficiency Interview.” Additionally, applicants that are invited to interview must do so. Applicants must also submit an application fee of $265.